Pectins are biopolymers with multiple applications because of their structural diversity and complexity. Although pectins from different sources have some common structural characteristics, many aspects of the common structure change according to the species and the physiological stage of the plant. Moreover, the application of pectin is determined by its chemical features, including galacturonic acid content, methoxyl content, degree of esterification and acetyl value. The most traditional raw materials used for the extraction of pectins are either apple pomace or citrus peels that are supplied as by-products of juice production. Both materials contain significant amounts of pectic substances, but with different chemical characteristics that make them suitable for specific applications. Considering that pectin is widely used as a functional ingredient, many researchers have been testing the use of other materials and alternative methods of extraction for industrial exploitation. 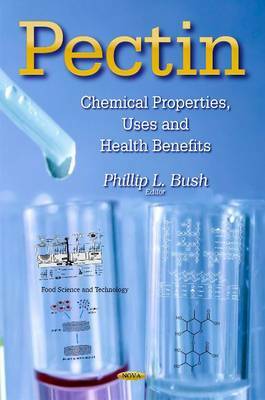 This book discusses the chemical properties of pectin. It addition, it includes the uses and health benefits that pectin may have.